The New York Rangers extended their winning streak to nine games by defeating the Toronto Maple Leafs by a final score of 4-3, improving their record to 14-2-2. The Blueshirts haven’t won nine straight since the 1972-1973 season and could tie their longest winning streak ever when they face off against the Tampa Bay Lightning on Thursday. New York is 11-0-2 in their last 13 games and find themselves at the top of the league with 30 points. They’ve scored 57 goals for and have allowed just 32 against, making them the stingiest team in the National Hockey League. 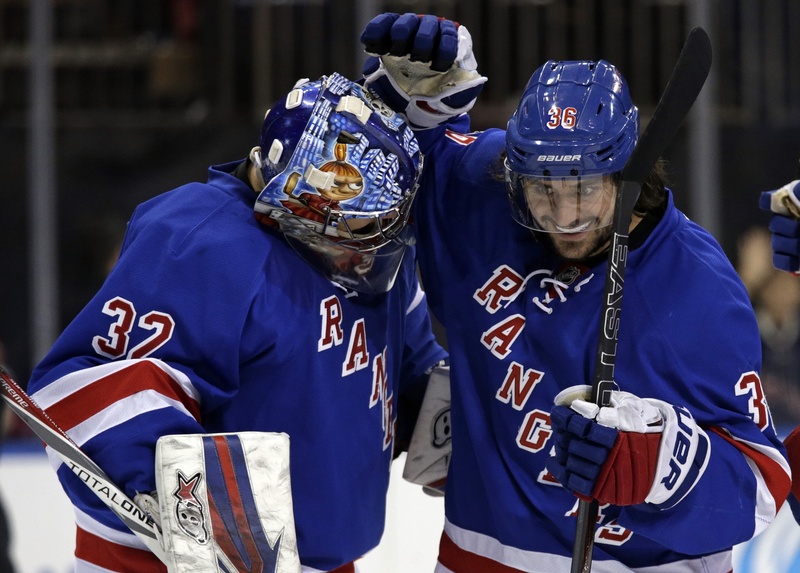 “I don’t know if there is a guy playing better hockey right now in the NHL than Mats Zuccarello,” Derek Stepan said. Stepan, by the way, slipped one past Toronto goalie Jonathan Bernier on what was in essence a dump-in from centre ice. Centre Derick Brassard has also seen the puck go in, with 13 points in 18 games. And Oscar Lindberg, the 24-year-old Swede, has a dozen points in 18 games and seems to be making the most of his first full campaign with the Rangers. Kevin Hayes also has a dozen points, while Rick Nash rounds out the top five with 10 points in 16 games. Of course, one can’t talk about the Rangers without mentioning the stellar play of Henrik Lundqvist. The netminder has 10 wins in 14 games and boasts a goals against average of 1.69 with a .947 save percentage. But it was backup goalie Antti Raanta that took home the win on Sunday, making 23 saves for a 4-0-0 record so far this season. Raanta has a 1.25 goals against average and a .955 save percentage.